The 8 3/8" multi-function kitchen shears are designed for both strength and convenience. An ideal addition to any restaurant or catering kitchen, the sheers boast an ergonomic, soft, non-slip handle that ensures safe and comfortable cutting. These scissors are a great buy for the money. They also come apart without loosening a screw so that you can sharpen them easily. Highly recommend them. Basically identical to a pair I needed to replace. Nice and sharp and Super handy that they break apart for cleaning. I don't really use the extra features (like opening bottles) but it's nice that the features are there if i need them. These are some very strong kitchen shears. It cuts steak and chicken and pretty much everything i have tried to cut it has worked great. this is a great set of scissors. Sturdy and durable as advertised. Cuts everything I need flawlessly easily cleaned with stainless steel blades. Couldn’t be happier. These shears meet the two most important requirements easily. They are rugged and easy to clean, so they get used every single day and save a bunch of time on certain tasks. The employees absolutely loved these as an addition to our kitchen. Compared to other shears, these cut incredibly well and don't seem to struggle with cuts that are on thin products. Of course they are easy to clean and know they are actually clean because the come apart and reattach easily. These kitchen shears are adequate but not the sharpest. The mounting pin makes for easy disassembly, but I have found the edge is not clean enough to easily cut twine, however solid pieces it works quite well with. These are great for the kitchen. I use them for cutting meats. It helps with some preparations as they are quick and easy to use for cutting foods that have fats and or sizing it down. Great shears. They are durable in size. Cut quickly and thouroghly, and the blade is sharp enough to cut through rough objects and food.Definitely the best shears! Every kitchen should have a pair of these shears! They are perfect for any need you may have in the kitchen. I like that they pull apart to make a single straight edge for cutting into boxes and such. I purchased three pairs. I bought two of these for my restaurant and I was extremely happy with what I got for the price that I got. They are quality shears. My sole pair of shears used up front for cutting our chickens and does it’s job so well. Zero complaints.that these would work well for essentially anything, we cut chicken bones with them! Great kitchen shears, we use this to cut meat, scallions. Very sharp edges and it's easier to cut meat with shears then using a knife. These shears can be used for almost any kind of cutting in the kitchen. The handles are nice to grip and it provides sharp cuts. These shears work well for light to medium tasks. The shears come apart easily when you need to clean it. I often find myself using them for really light tasks when simply scissors would be efficient, but I am working in the kitchen and can easily use these. If I needed to cut through bone, I would use my larger shears. These are great sheers. They cut well and stay sharp. I use them to cut thin slices of eat into strips and a variety of vegetables. Great shears! My favorite thing about these multi-function kitchen shears is that they really easily disassemble. The two pieces easily come apart for very easy rinsing and drying. They are quite large though. These kitchen shears are perfect! They are so affordable and such a great value. We use them for herbs and veggies in the kitchen, but they are tough enough for any project. Easy to clean because they come apart and can go in the dishwasher. Very pleased. These kitchen shears are a great size, comfortable to use, and are shipped very sharp to last a long time. Simple design and a great price, can't argue with that! Great pair of shears. Very sharp so be careful. These were used by kids at a kids cooking camp. Kids said they were easy to use. This kitchen shears are great for a variety of cutting needs in the kitchen. These easily come apart for cleaning. Great price and product. Thank you! Great shears! They are sharp and can cut meats and vegetables easily. It is a good price and I would recommend for others to purchase. Shears are a great addition to the kitchen. Easy to take apart and clean and are durable. Strong shears that do what they are supposed to! Great shears for a great value! These shears are very easy to clean because they pull apart, ensuring the upmost cleanliness. All at a steal of a price! A must have! These scissors are great and don't seem to wear out. They have stayed sharp the entire time of me using them. I will purchase these scissors again. These scissors are made of stainless steel, so they’re perfect for kitchen applications. The handle has a non-slip grip, and the design even includes an integrated bottle and can opener as well as a zester, nut cracker, and screw driver…that’s more features than my expensive Cutco Super Sheers! I really enjoy using these shears. They're very sturdy and well built shears. They break down easy for cleaning. I haven't had any trouble with sharpness. Would defiantly recommend. Value prices kitchen shears.I would say they are medium duty nothing heavy duty. But that is what we ordered them for. I would recommend them for medium duty use. I really love the quality and the design of these shears. The blades are very sharp and the shears are well made. This is great for use in any kitchen. These are great shears, they crack nuts and other hard foods and are nice and sharp for cutting green beans or other foods. They also come apart for easy cleaning! these multi function shears 3326606 are very handy kitchen shears. worked for us on herbs, chicken, bags, and even paper when u need to cut parchment. try them and God bless! These multi-function Kitchen Shears are a very nice kitchen tool. They are easy to clean, especially because they come apart to clean all the nooks and crannies. Just don't lose one side! These are great! A major improvement to the safety scissors I was using in the kitchen before...yeah. These will chop through anything, and I like that they come apart easily for cleaning. For the price a nice, heavy duty pair of shears. The action on them is good, easy to open and close. The handle is comfortable enough to use repeatedly without hurting your hands. I think there are better shears out there for a lot more money, but unless this is your all day job, these do quite well. Nice pair of kitchen shears that won't break the budget. Comes apart for quick clean up and sanitation. Sharp edge and sturdy construction make going through thicker products much easier on the hand than other brands. Used these scissors for catering an event. Truly multi-use scissors. The fact that they come apart easily to clean is both a pro and a con. Nice that they can be cleaned without too much fuss over how to take the blades apart; however, if you separate the blades too much while using them, they come apart/separate on their own. Not the most reliable scissors. Great product for the price. Not the best shears I've ever owned but they work well enough for lightweight tasks. I haven't tried them for heavyweight tasks. I thought the tools on the end would be a nuisance but they're fine. There are better shears out there, but for the price these are nearly unbeatable. I wouldn’t call them heavy duty. I wouldn’t use them to cut chicken all day but they work great for lighter tasks. They come apart and wash up easily. These shears are a life saver! With the multi function uses we do not need to have a bunch of utensils in our way when we are processing a batch of Cornish hens. These are easy to clean and they come apart for deep cleaning. We found these shears to be a poor product. They broke after only a couple weeks of use! They were excellent up until then though. We appreciate your review, Saxon! We are sorry these kitchen shears did not meet your expectations. If you are looking for a product that would better suit your operation, please contact our Customer Solutions team. High quality steel, very sharp. They sharpen evenly, and are a staple in our kitchen for trimming meats. Buying several more soon so each chef has their own! Very sturdy and well built shears. I have only had to sharpen these one time which they are easy to sharpen. They break down easy for better cleaning. These scissors have worked great! They allow for easily cleaning as they can be taken apart. These scissors are a must have at every restaurant!! Good functional Kitchen Shears. The blades come apart so you can thoroughly clean them. Not crazy about the extra tools that stick out on the top of the scissors- but getting used to it. These work great and stay sharp. I have used them for several months and have had no issues with them and they come apart super easy to clean. Shears are so important and useful in the kitchen. Its also helpful that they come apart for cleaning. We keep multiple pairs around at all times. This is a fine set of kitchen shears. I mainly use for cutting or snipping herbs. They get the job done and even for a left i was somehow able to use them. Multi Function Shears are nice addition to the kitchen. They come apart, so that can be a bit annoying if you open then too far. Just your basic pair of kitchen shears but they have held up well so far! I like the fact that you can take them apart to clean them. I use these shears every day, all day. They come in handy when i am cutting open large bags of fruit, meats, ad or veggies. I use these Multi Function shears all the time. I do a lot of packaging so they come in handy for cutting string as well as cutting parchment sheets to size. I only wish that they would come apart for easier cleaning. Multi function kitchen shears. They are 8 3/8" long and can be used for opening packaging of for cutting food. Always in need for scissors and at this price it was a great deal! These are really easy to clean since the two sides come apart. They don't cut quite as well and conventional scissors, but it's not really a problem. One pair out of the many we've bought were a little too tight and didn't work well. the rest have been great. Have been using this pair of shears for years with no problems. They have stayed sharp. I also like how they come apart for easier washing. Great quality scissors for the price. We use for general use around the kitchen so they work great for us. Nothing fancy here but good price point and I don't get as upset when a pair gets lost. Sir Clean recommended this product 8 3/8" Multi-Function Kitchen Shears, you can separate in 2 pieces to easy cleaning, multi-purpose, the best thing about this product is ergonomic design. Love these shears for that they are but they often break apart even during normal use. The two pieces are connected by the red piece in the picture and it's not uncommon for the scissors to break into half while using them, it would be a little dangerous if someone wasn't being careful. Easy to put back together but I really expect that they would stay together while using them as their designed. Thank you for your review, Patrick! We are sorry these shears have not worked well for you. A Customer Solutions Representative will contact you soon! Great heavy duty kitchen shears. They come apart for easy cleaning, which is a huge plus in a commercial kitchen. Very sharp when they arrived and haven't seemed to dull much yet. You really cant beat this tool for the price and what it can be used for. We use it on various products in our operation, but the tool holds up well and stays sharp for a very reasonable amount of time. Don't get me wrong, they do not stay sharp forever, but I have yet to see a pair go dull before their time. They will get through small chicken and fish bones with ease. Great kitchen shears! Sharp and easy to clean. Gets plenty of use in our kitchen and are holding up well. The bottle opener comes in handy as well. great scissor or kitchen shears, they work really nice, and have many functions, for the price, you do not need to worry about them breaking. good stuff! 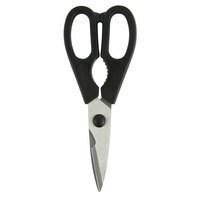 These are excellent scissors that are great as a food safe addition to the kitchen. They hang up on metal magnetic strips, and also on hooks. This is a great set of shears for any uses around the kitchen. Very solid construction and a back portion that is a bottle cap remover as well. I love this multi function kitchen shears. I have them in my kitchen always ready. I love the opener for bottles and other features! Great price too. Shears are great for prep work. They cut through bone fine. Quality seems decent they should hold up for a long time. Grip is decent, nothing to really love or hate about these but the price makes them an awesome value. Super sharp, super easy to take apart and throw in the dishwasher, and super inexpensive! I cannot believe the quality of these shears for the price! They spatchcock chicken with ease. I won't ever buy another set of shears! These 8 3/8" Multi Function Kitchen Shears are just your basic shears, but really nice quality and price. Overall, for this price, I don't think you could get anything better! A good pair of kitchen shears is essential in our kitchen. I've had these for over a year and they still work great. Would definitely repurchase if needed. Not as good, but gets the job done. Not as sharp and splits apart lot of time when cutting small amounts. 3/5 for the product. Great price for these shears. These kitchen scissors do a multitude of task, including cutting. They cut almost anything with easy and so far they are working great. These are easy to use and are great for all shearing needs. High quality and at a great price! Would buy again and recommend to others. I mostly use kitchen shears for smaller tasks (like cutting kitchen twine and smaller items) and don't really use them to break down poultry or anything, but right out of the box these were sharp and sturdy. I have an older pair that is painfully dull and it's like night and day with these and the old pair. Excellent little set of shears! Very multi purpose. I was able to cut the back bone out of a turkey with these, which I was not expecting to be able to do. They come apart at the hinge for easy cleaning to make sure no food gets stuck in the seams. Scissors is ok. It comes apart easily for cleaning but doesn"t always cut the best. If you are looking for something to cuts really good I would go with a different one but if you are ok with mediocre then this is good for you. I wanted some kitchen shears that were good for everyday use. I have an expensive pair for cutting up chickens, etc, but don't want to use those for everyday tasks. I have bought several different shears, but they all have problems. Some didn't come apart easily, or if they did, they also came apart while using. Some rusted a lot, others weren't sharp enough. I love this pair as it is plenty sharp, comes apart easily to clean but stays together while using. They haven't rusted at all either. Overall this is a great pair for everyday tasks and I'm going to buy a couple more since I often find myself without a clean pair and have to stop and wash a dirty pair. I'd rather just have several clean pairs available when cooking. The scissor function of the kitchen shear works fine, cuts chicken bones and fish easily enough. I don't like the bottle opener, it digs into the hand when you use it. Excellent value. These shears come apart for better cleaning purposes. The serrated tips are a nice bonus. Keeps its edge well. Don't know why there's a can opener on the bottom though. These are great little kitchen shears. I use them daily to open my sous vide vacuum bags. They are also tough and easy to clean. These are great kitchen shears and are very sharp! I have had no problems with these and they are really easy to clean. Would recommend. Good shears. Sharp and cuts well. I don't think these are the highest quality in the world but work well for my home/kitchen. I love that they come apart for cleaning. We love these kitchen shears so much that every time we make a Webstaurant order, we think about ordering another one! Not only do they come apart for easier cleaning, they can cut almost anything -- meat, herbs, pizza, even cardboard. Love these scissors! I keep ordering more pairs so that no matter where we are we don't have to look for them. It is much safer to open bags with scissors than a knife. They come apart easily in order to wash them. I think we have only had 2 pairs break over 4 years or so, probably from getting dropped. I thought that for this price these shears would be good for a month or so. I use them pretty much everyday and they are still just a sharp as when I bough them! Can't go wrong with these! Great for opening bags or cutting through poultry. We use these on a daily basis. Very durable and easily washed off with a dish hose. I bought two pairs - one for standard scissor jobs and one for traditional "kitchen" jobs. These are great in both categories. They're ambidextrous and comfortable. I did have a bit of trouble separating the blades for the bottle opener. I'm having trouble with the "peeler" claim. No idea where that function supposedly exists. I haven't broken down a whole chicken recently, so I can't yet speak to the effectiveness of the bone notch. These shears are very useful and cut through herbs well, which is what we will be using them for mostly. The bottle opener, peeler, zester, nut cracker, screwdriver, and lid lifter that are in these are pretty awesome BUT it makes the sends of the shears very sharp and dangerous. You have to be aware that these are not ordinary kitchen shears with safe handles when you use them. The shears themselves are sharp and cut well and come a part so you can easily clean them. All in all wonderful addition to any kitchen. Just be careful of the sharp ends. Love these kitchen shears. They are very sharp and we love that they come apart for ease of washing. The handles are also fairly comfortable for scissors. We love these shears. Replaced my old only shears with these. Love the flexibility so you aren't running around the kitchen looking for different arts and they are pretty sharp. highly recommend these. These are great shears. There are so many functions you can use them for. I really like the fact that you take these apart easily for cleaning and sharpening the blades. Something you can't do with the cheap ones! This is one of the best scissors I have ever had. It cuts through everything I've needed to very easily. It fell once and came a part, but assembling it back together was so easy and it worked as usual. No instruction needed. May buy another. you would use this kitchen shear to cut everything like paper, food, and box. i am glad to buy it. easily to clean the surfaces. These kitchen shears work great. They are good quality and don't rust. They're easy to clean up and the extra functions on the handle are handy. These are a necessity in any kitchen. They work great and being able to seperate the blades makes them so easy to clean. Highly recommend this purchase. Well shears are going to degrade... and they aren't worth trying to sharpen... This will do for about a year of heavy duty cutting... Then will need to buy more. Price is great as usual. Handy dandy nice set of shears. On my wish list to grab couple more pair. Cant go wrong with them price. We use them for everything , including cutting food products. Great shears that we use for cutting everything from food, meats AND paper products. You can also take apart and use as a box cutter. Superb! Great multi use shears, strong, sharp and easily come apart to clean in between the blades. Comfortable for left or right handed cutting, have not needed the additional can opening sides of the handle, but it is nice that they are there. Great kitchen shears. Easy to clean, easy to use, easy to cut! It is quite a bargain on webstaurant so purchase along with other kitchen gadgets! The kitchen shears are perfect for any cutting needed in a kitchen. They fit well in your hand and have a nice feel to them. They also come apart for easy cleaning. These shears appear to be a lot of bang for the buck. I especially like that the blades easily come apart for cleaning. I would definitely recommend! I purchased the 8 /8" Multi-Function Kitchen Shears early this week and they came to me in 2 days! awesome! anyways, the shears worked great for opening blister packaging and opening a beer bottle cap. I think they are going to last me years! Thanks! The best kitchen shears ever! Hard to believe that an inexpensive kitchen tool can be so useful. They work really well, plus Hubby and I really appreciate that they can so easily be taken apart and washed in the dishwasher. You can't beat that. These multi-function kitchen shears work fantastic in our kitchen. They are used on a daily basis for over 1.5 years, and they have not needed to get sharpened. These are great multi purpose kitchen shears, They are strong enough to cut through small bones. They come apart for easy cleaning. Great price. I highly recommend. Best kitchen shears out there for the money. Multi-functional and pretty sturdy. And surprisingly sharp! Definitely grab a pair or two of these if you need some kitchen shears in your kitchen. I love these kitchen shears. They are sharp and heavy duty. The main reason I purchased them was because they come apart for easy cleaning. I have several pairs of shears and I reach for these the most. I'm always buying kitchen shears because I either seem to break them or they just aren't comfortable in my hand. Well, these not only feel nice in my hand, but they are probably the sturdiest shears I have ever held. I am so glad I found these! Nice, sturdy kitchen schears. Great for cutting twine and food. The two sides of the scissors come apart nicely for a thorough cleaning. We routinely put them through the commercial dishwasher. Awesome shears for the price. We mainly use them for cutting open bags, products, etc and they are sharp enough to handle the job. We also like that they have multiple functions, even as a can openers and have finger guards. You can't beat these. They are sharp and do an amazing job on bones. The price is perfect and the fact they come apart for easy cleaning makes them one of the best deals out there. Nice shears for the price. Nothing really special about them. Good construction, the tools on the end are nice every now and then but not really amazing. Great pair of scissors. They are sharp. I love that they come apart for easy cleaning and drying. They feel very comfortable in the hand. Finally a pair of good kitchen shears! Great for cutting into chicken, hot peppers, scallions, I even use them to cut open my food packages that are hard to open with my hands. i am loving these kitchen shears. They are very sharp and can easily come apart for cleaning. The bone cutter is a plus as well. Very good scissors for the money. They cut well and they also come apart for easy cleaning. They have a bottle opener and screw driver on the handle and they even have pliers built in. I have used these almost every day since receiving them. There great and very easy to clean I just run them through the dishwasher. These are well made and appear to be holding up well. I love these shears! I had a pair of Mecer shears, that were amazing, "disappear " on me. These are just as good if not better! I haven't used all the extra bits, but it looks very handy. And they have a bone cutter! Makes cutting wires for flowers great! These shears are great, and you really can't go wrong at this price. The blades come very sharp, I've used it to cut through plastic packaging as well. The handles feel nice, there's a little bit of friction in the cutting motion which is something I really like. The shears detach easily, and fit back together very nicely and easily. The whole product feels very solid, and to be honest, this is probably my favorite pair of kitchen shears. These are very good kitchen shears.I haven't had any problems with them.I tell of my all of my friend about them.I buy a lot of supplies from Webstaurant. We find new ways to use these all the time. Of course, they are sharp and cut anything you need. They have stayed sharp, too. Great shears feel very solid, they are sharp and what is probably the nicest thing is that they completely pull apart if you open it all the way with ease so you can clean it. No screw in the middle to get loose or mess it up. These shears are great, especially for the price. At this price, you don't really care what happens to them. I've given them to my parents and siblings, and they were impressed. Quite sharp, come apart for easy cleaning. Also work as bottle openers, etc. I've only used them for cutting so far, though. These are great! I can't believe what you get for the price. I'm going to buy a few more. They cut great, and they can come apart for easy cleaning. These shears are perfect for cutting herbs and for other tasks in the kitchen. Cuts right through bones in roasted kitchen and slices through thick plastics when un-packaging fish. I love my Kitchen shears. They are great for everyday use in or out of the kitchen. The end of the shears even opens bottles. How great can that be, at such a good price. Thanks WEBstaurant. These are good, heavy duty shears. They come apart into two pieces. I guess for thorough cleaning. They're very strong. I've even used them for cutting through chicken bones. These are the go to shears in my kitchens. They're surprisingly sharp and the perfect size for everyday jobs. I recommend purchasing more than one pair. Great set of kitchen shears. These have been great in the kitchen and handy with a bottle opener on the backside of the handle. We've ordered several pair of these for the kitchen to date. Very satisfied with this this product. So many uses for a good pair of kitchen shears from food prep to opening packaging. These are quality constructed with sharp blades, and a heavy duty feel. Highly recommended product. Perfect shears for opening just about any kind of packages. We even have second pair for food prep with chickens and fish when we have to break them down. These are good shears for cutting open anything you need in the kitchen. They are well made and you just can not beat the price. Every kitchen needs a pair of these kitchen shears. I use them for work and my own kitchen. Great for opening bags. cutting paper or boxes. A good pair of shears is what every kitchen needs and these shears fill that role perfectly. They fit in your hand great and will cut through anything. Highly recommend! These are basic kitchen shears that work nicely to cut cheesecloth and even for cutting fish bones! Great all purpose kitchen scissors! Fantastic online price!!! These kitchen shears can do everything! Cut butchers twine in one clean cut and then go into cutting lobster tails. A mush for a chef to have in their collection. These shears are perfect for any job around the kitchen. They price is right and they get the job done. I would recommend these shears. I've been using these shears for several months and they still cut like I bought them yesterday. It was a great deal and I thought I'd try them. I'm glad I did.